Aruba snorkeling is one of the many fun and interesting things to do in Aruba waters. This is one of those fun Aruba activities that you can do by going off on your own, or by using Aruba charters with an Aruba guide. You can use your own snorkeling equipment, or rent good quality snorkeling gear. Snorkeling in Aruba can be both relaxing and exciting at the same time! There are a number of beaches of Aruba that offer you some of the best Aruba snorkeling adventures in the Caribbean. You will see a variety of coral formations, as well as an assortment of marine life, and a shipwreck from WW ll. 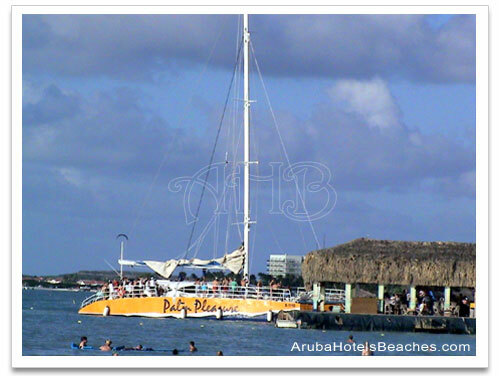 One Aruba beach known as Baby Beach is where you will find calm, shallow Aruba water. This area is great for families who want to snorkel together, and for beginners. The opening in the reef is only about 10 feet, where the water rushes in. Your children will probably need something or someone to hold onto until you get past this deep area. Once you pass the area you’ll be in a 4 foot deep section where you can actually stand up. You will see a large number of fish at this spot swimming all around you. Your kids will be thrilled! Another one of the beaches best known for Aruba snorkeling is Boca Catalina. You will find this beach along the road that leads to the California Lighthouse, just before Arashi Beach. It is a small beach with a small parking area. Here you will find a variety of marine life such as barracuda, octopus, fish, lobsters, and more. For the more experienced snorkeler, there is the WW ll German Ship Wreck Antilla. I suggest you take a boat to get to it since it is too far to swim to and the water can be rough. Aruba snorkeling can also be enjoyed at the north western tip of the island at Arashi Beach. This area is one of the favorite for snorkeling in Aruba. The water is calm, there are beach huts for shade and plenty of parking. The water by the reef can be 1 foot to about 15 feet deep. Be aware that the current can be very strong past the Arashi reef. You will be amazed at the variety of tropical fish such as angel fish, parrot fish, sea turtles, octopus, crabs, lobsters, schools of reef chromis, large shells and colorful coral formations that are all for your viewing pleasure. Mangel Halto Beach is another good spot for Aruba snorkeling. It is located on the (south) west coast of the island, and has shallow, clear water and an amazing variety of marine life. Many come here with a picnic lunch. You can access the reef by walking in from the shore or chartering a snorkel boat. 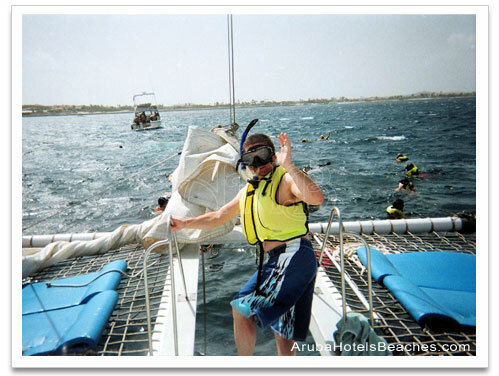 There are a number of snorkel tours on the island of Aruba. Check at the Activities Desk in your hotel or resort for information. They will give you prices and tell you what is included in the price. Usually the price includes renting the snorkel equipment (Aruba snorkel, face mask and fins), snorkel instruction, drinks, snacks, and lunch. Most are half day cruises either morning, afternoon, or an evening sunset cruise. Most include a large group of people, but you can rent a private charter for a smaller group. Located at the DePalm Pier on Palm Beach between the Riu and the Radisson. They take you to Catalina Bay, Arashi Reef, and the famous World War II wreck, the Antilla. It is a 4 hour sailing and Aruba snorkeling excursion and includes a buffet lunch, open bar, snorkel equipment and instruction. Includes sailing, snorkeling, snorkeling gear, swimming and the popular Rope Swing along with open bar and BBQ. They take you to Malmok, Boca Catalina and WW ll shipwreck Antilla. This is usually a lively, fun tour! They offer snorkeling and sailing tours for small groups, as well as, romantic sunset Sails for two. Usually the price includes sailing, snorkeling, drinks, food and complimentary video. They are located at the dock by the Marriott Surf Club on Palm Beach. This is a family operated snorkeling and sailing cruise on a 43 foot yacht. They will take you on a scenic cruise to a private reef island for a fun snorkeling experience...and the Captain’s Mom will prepare a delicious lunch for you! The price includes snorkeling equipment and free lessons if needed. They depart from DePalm Pier on Palm Beach between the Riu and the Radisson. Snorkeling and sailing tours with Captain JJ and Chef Katrin. Great hospitality and great food! Charter the Morning Star for 11 people or under with open bar, tailored menu, snorkeling gear and towels included. They usually depart from the Varadero Marina. There are many other Aruba Charters to choose from, so make sure you check with the Activities desk at your resort. Just remember that all coral are living organisms and should not be touched. It is not only bad for the coral, but you can get a bad burn and itch, from contact with the coral. You should also know that those beautiful shells that you will see may have living organisms in them and are not allowed to be taken out of the country. Make sure you use plenty of sunblocker, especially on your neck, back, and the back of your legs while snorkeling. Some snorkelers also wear a tee shirt. Always be aware of your location and watch out for currents. Most of all have fun! After an exciting day of Aruba snorkeling, you might want to enjoy a Jeep Tour around the island of Aruba and experience Aruba’s Arikok National Park. Click here to return to our Aruba Activities page.